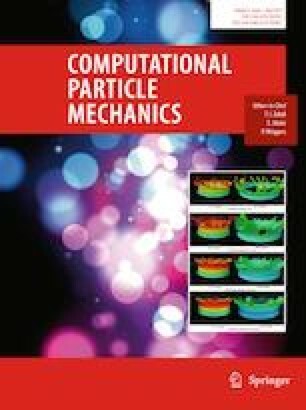 This paper presents an unresolved computational fluid dynamic–discrete element method (CFD–DEM) model for the simulation of flows mixing fluid and grains. The grains trajectories are solved at a fine scale using a discrete element method. It provides the velocities and the trajectories of the grains with an accuracy that is needed to describe microscopic phenomena like clogging in pipe happening in these flows. Solved at a coarse scale using the finite element method, the fluid motion is deduced from a mean continuous representation of the fluid phase giving computational performance and keeping variables evolutions that are of interest for a lot of simulation processes. The key point of this method lays in the coupling of the two different representation scales. An empirical drag formula for monodisperse granular media parametrises the transfer of momentum between the phases. Applying this model to the well-known problem of suspension drops provides validation and insight in this kind of methodology. Simulations in which inertia is non-negligible are achieved to prove the generality and adaptability of the unresolved CFD–DEM model compared to other models. Matthieu Constant is a Research Fellow with the Belgium Fund for Research in Industry and Agriculture (FRIA). This study was funded by the F.R.S.-FNRS through a FRIA Grant (29627518).